A comfortable and safe environment. A supportive lifestyle and homelike atmosphere. A patient, attentive and kind staff, and an unwavering dedication to seniors and their well-being. 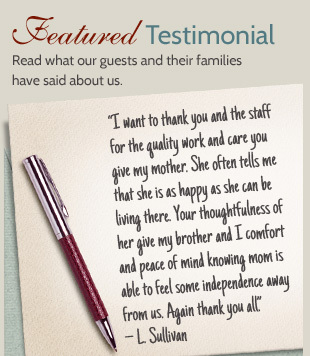 These are the principles we stand for at Caregivers Inn, and we have been providing them since 1990. Residents at Caregivers Inn will enjoy many of the pleasures of independent living without the worries that can accompany it and the reassurance that helping hands are always nearby. You or your loved one will truly enjoy the company of neighbors yet maintain your privacy within a protected and welcoming environment. Come & Visit Us in O’Fallon, Missouri to See Our Facilities for Yourself! Our entire staff is devoted to meeting the emotional and physical needs of our guests, as well as establishing genuine and compassionate relationships. Our room and board rate is all inclusive, and there is not extra charge for meals, assistance with bathing, nursing supervision, medication administration or any of these additional services and amenities. We purposely overstaff beyond what is required of traditional facilities so that everyone can experience personalized service. We invite you to visit our home to see just how amazing and unique our services and amenities really are. Contact Caregivers Inn today!